I was a little bit bummed out last night when I posted. I hate that I did not get my workout like I wanted but I dwelled on it and just could not let it go. Well as crazy as it sounds, I got home last night and got my house cleaned up, got my stuff together for today and got my clothes laid out for the next day and I felt soooooo much better. I find that when my house and my stuff is in order I feel better. I know it makes no sense but it does to me. Well today, I can say I was not avoiding the post because I didn't do my workout, just that this is the first time I have sat down at a computer that I can post from. I got up this morning and went for my run, then Zumba. It was a nice run, about 4 miles, and I enjoyed getting out there. I did however get a little bit lonely, I didn't have any running buddies. But all was ok because some of my besties were in Zumba today. That was another workout I have missed. 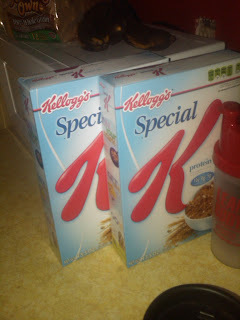 As far as the Special K diet goes it was short lived happiness. I think it has been relatively easy thus far because I haven't worked out like I usually do and have not been exputing the calories I normally do. Today I was hungry the entire day. I felt like all I did was snack all day long. The foods that I get to eat are good but they are such small portions. By dinner time I was starving. I think I am going to have to eat my full meal at breakfast or lunch. Another thing about this diet that I don't know about is the number of carbs that I consume. I am not a carb counter but I try to keep this number under control, but the total carbs are high. I will not know how this will effect the weight loss until I weigh again on Wednesday. I bought the Special K snack crackers today and they were actually pretty good. The food is good, just not enough. 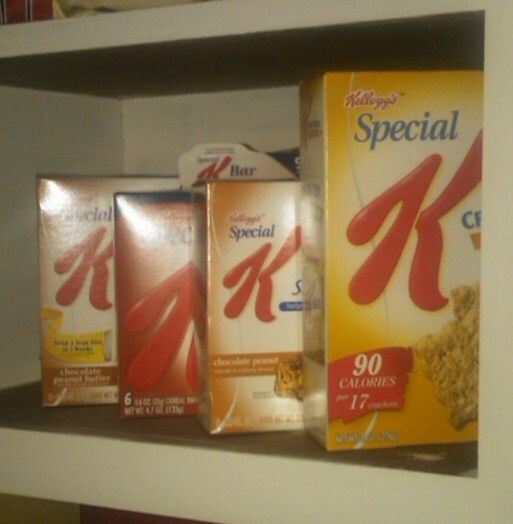 And when I opened my cabinet I realized that Special K has taken over my house. Tomorrow I am trying something new for my workout. Normally when I do a pool workout I just swim laps but I am trying a planned workout. Its one that includes flippers and paddles and specific distances. I don't know how it will work but I am excited to try something new. Goodnight to you all, wish me luck on a new workout tomorrow and I will for sure let you know how it goes.